group of 75 antiracism protesters gathered this afternoon on the landmark Erasmus bridge in Rotterdam to protest against institutional racism in the Netherlands. The group hung banners from the bridge with the text ‘Black Pete is racism’ and ‘listen to black voices, don’t makes blackfaces’. This refers to a Dutch holiday tradition which is heavily criticised as racist, since it involves several weeks of people dressing up as ‘Zwarte Pieten’ (‘Black Petes’); acrobatic characters who typically wear blackface paint with red lips, golden hoop earrings and black curly wigs, dressed in colourful costumes. 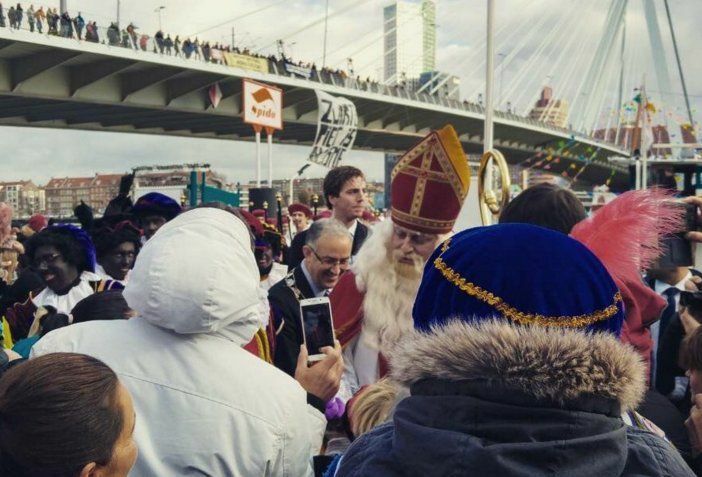 These characters in blackface act as servants to a white, saintly figure known as Sinterklaas. Over the last few years, the movement led by black Dutch people has become very vocal, organizing protests against public performances of these Zwarte Piet characters in blackface. 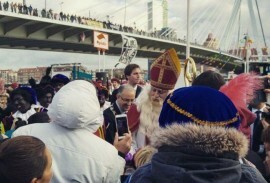 Each year in November, thousands of people traditionally gather to greet Sinterklaas and the Pieten as they make a first appearance. In most cities this tends to be staged as a big event, including a festive parade though the city, and a public welcome speech by the mayor. The protest in Rotterdam was organized to coincide with such a parade.